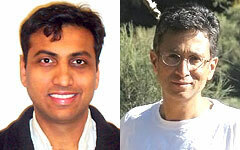 Associate Professor Ankur Srivastava (ECE/ISR) and Professor Prakash Narayan (ECE/ISR) have been awarded a new, three-year National Science Foundation (NSF) grant worth $450,000 for a research project titled “Information Theoretic Multi-Core Processor Thermal Profile Estimation.” Srivastava is principal investigator (PI) for the research grant while Narayan is Co-PI. Dynamic thermal management is the process of controlling surges in the operating temperature, especially of a multicore processor, during runtime based on limited measurements by on-chip thermal sensors. Managing thermal sensors and processing their measurements presents a rich vein of theoretical and practical challenges including: deciding on the number, location and type of thermal sensors; estimating the thermal profile; and characterizing the fundamental performance tradeoffs between sensor quantity and complexity in guaranteeing estimate accuracy. In this interdisciplinary project, Srivatava and Narayan propose a new approach to the problem of thermal profile estimation in multicore processors that relies on fundamental information theoretic principles. Their approach rests on new problems in information theory that capture the salient features of on-chip thermal profile estimation. The associated new formulations are inspired notably by rate distortion theory and also bear a similarity to compressed sensing. Furthermore, the approach has wider applicability to general problems of parameter estimation based on limited sampled and quantized measurements. The project has a home in computer architecture and VLSI design as well as one in information theory and compressed sensing. Its potential impact is twofold: (a) improvement in the performance and reliability of multicore processors; and (b) introduction of new models and problem formulations in the fields of information theory and compressed sensing. The broad reach of this project will provide a valuable learning environment for the investigators and their graduate and undergraduate students. The basic elements of the technical approach will be discussed in special topics courses and seminars with the participation of graduate students. For more information about the research, please visit the NSF website.